I came across this image on Tumblr tonight and immediately, my childhood reading experiences came back to mind because I read all of these books. 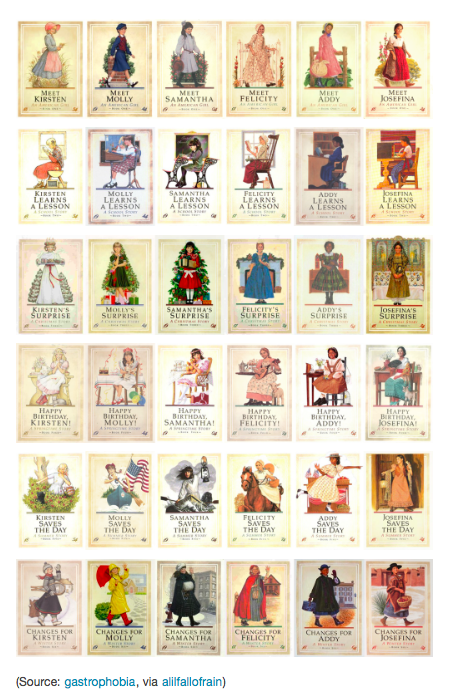 These are the original American Girl books--historical fiction stories for children, about a ten-year-old girl living in different historical periods. These books are probably the reason for my historical-seeking reading behavior now. I think I started with Addy's stories, then read Samantha and Kirsten's in school. In about third grade. Then I definitely remember reading Molly's stories and then, later reading Felicity and Josefina's books. 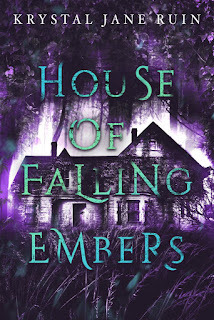 I had most of the books at home--and they were such gorgeous books and the historical notes at the end were the bomb. So. Yeah. Slice of childhood. I had no idea about books series while growing up. I wish my parents had pushed me more into reading than they did. I did not discover any series or brand of books until my first Harlequin. Then I was stuck, but not in a good way. It was an escape, but not the kind I needed to nurture my independence. Today, I'm discovering whole new lines of books and their readers. Thanks for sharing. I went from American Girl, Babysitters Club, and Dear America into romance novels---completely skipped anything YA. Yep, totally screaming right now. American Girl! *warm fuzzy memories all around* I didn't read any of Josephina's books though, just the original five. Memories!! I had the Josefina doll--I only just gave her away to my niece a few months ago. I was pretty obsessed with American Girl for a long time. Sadly, I never read them! I think at that age I was stuck in the Babysitter's Club, Sweet Valley Jr. High, and the Adventures of Mary-kate and Ashley! Oh I do miss childhood! I was really into Babysitters' Club, too. I only had Josefina's!!! Didn't finish the set tho :( but I subscribed to the magazines and would always want one girl! Then the babies came :) awe. Still want!